Caritas Sri Lanka is providing widows and vulnerable people with houses, livelihood support after the end of the civil war in 2009. 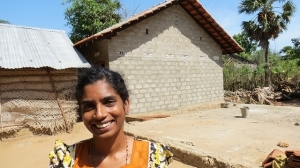 “I never dreamed we would have our own home again,” says Vadivaperumal Letchumi, putting the finishing touches to her new house, built with support of Caritas Sri Lanka. The 42-year-old widow lives in the north east of the country with her two children. It’s a region emerging from a three decade long civil war that ended in 2009. Her previous home was destroyed in that conflict and her family had to flee the fighting. As she and her daughter prepare the evening meal, her 18-year-old son returns home from his work as a fisherman. Her husband did not survive the war, and her son is now the main provider for the family. “It’s a big responsibility for such a young man,” says Vadivaperumal. “But with this new home, we feel ready to face the future”. Around 120,000 houses were destroyed and 40,000 partly damaged in the conflict. Some have been or are in the process of being built or repaired, but there is still an 80 percent shortfall in the numbers needed. Caritas Sri Lanka says it’s a gap that must urgently be filled, with vulnerable groups like widows and their families being on top of the list of those requiring help. “They came back to their villages to find their houses badly damaged or destroyed,” said Fr. A.J. Yavis, the current director of Caritas Vanni, one of the local diocesan Caritas operating in the area. “They had to start from zero”. 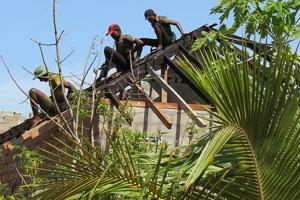 After providing emergency relief and temporary shelter, his team have now begun building permanent homes. The needs are great. Caritas Sri Lanka is providing widowsand vulnerable people with houses, livelihood support after the end of the civil war in 2009. “We had only tarpaulin sheets to live under when we returned,” said Wimalathas Ganasoori, “It was very tough”. The 37-year-old mother of five is another war widow, one of 40,000 in Sri Lanka. Her families lived under the makeshift plastic sheets for over a year before their new home was ready. Caritas staff work with the families, helping them design their future houses based on their individual needs. Caritas contributes over half of the cost of the home, with the rest provided by the families themselves. Wimalathas was helped to build her home by cousins and neighbours, the community coming together to ensure the work was completed. In May 2011, the family moved into their new place. “If you are surrounded by jungle, with snakes”, she said, “having a front door you can close at night makes all the difference”. Shelter is only part of the picture. With a small loan provided by Caritas she has set up a shop. It helps pay their living expenses and means that the children can resume their education after years of disruption. Caritas is providing other economic support to families affected by the war such as fishing boats, help with farming, and training on how to save and manage money. Mrs S. Jesunayagi lives in a fishing villages called Selvalpuram. She has experienced much suffering. She lost her husband in a fishing accident many years ago. More tragedy followed in 2004. The tsunami that devastated much of Indonesia, India and Sri Lanka, destroyed the village. Then in 2009, the villagers had to flee the fighting. Many of the widows Caritas helps come together in women’s groups, like the Women’s Rural Development Society in Veravil. It consists of two groups, with just under 50 women in each. Providing for their families is a major concern, so Caritas helps with training on how to manage and save money and run small businesses. As well as supporting each other, volunteering at local schools and hospitals, the women also lobby local officials on issues of importance such as the need for a more accessible clean water supply, better maternity care in the hospital and a community hall. Three decades of war left many people injured. Abraham Cruz is 46 years old. His family live in an area of the Mannar district that was on the front line. Their house was destroyed and Cruz lost his legs in a shelling incident there in 2008. He receives support from Caritas Mannar, the local diocesan Caritas in his area. It runs the Visiting Centre for the Disabled, which helps wounded people—many of whom have been wheelchair-bound or house-bound—start walking again. To date, over twelve hundred people have been helped via the centre. Providing new artificial legs with the best available technology, the Centre transforms lives. As well as fitting new legs and teaching people how to move around again, Caritas Mannar helps people like Abraham Cruz with a new home specially adapted to their needs. There is a long way to go in Sri Lanka’s regeneration. The people of the north east need more houses and more opportunities. Many still live in poverty. Memoirs of the war are still fresh. But after decades of division, people are united in expressing their desire for peace. Caritas Mannar Disability Centre has 1215 beneficiaries who have received new limbs. Hope is found in stories like Justine Pradiba, a 27-year-old double amputee. She lost her legs in an explosion when she was only a young child. With the help of the Caritas Mannar Visiting Centre for Disabled, as she grew up, she was given new artificial limbs. Although she didn’t ever think she would marry, a young man kept showing up at her parents’ house and in 2005 they wed. A boy, Ari, was born in 2006. She was displaced during the fighting, but is now back home. She receives help and support through Caritas and can offer advice to those who have also lost limbs. Like other people at the Centre, she feels ready to carry on. “We have a chance at life now,” she said. 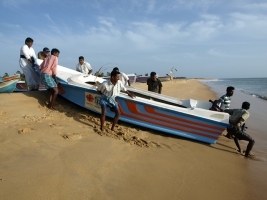 Rebuilding Sri Lanka isn’t just a question of bricks and boats. Bishop Rayappu Joseph of Mannar says that physical and economic reconstruction alone will not help achieve unity and reconciliation. “People must be able to live with dignity, equality and freedom”.